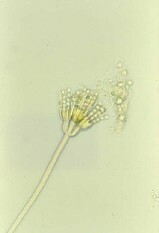 Penicillium species have small unicellular spores that are spherical, sub-spherical to ellipsoidal. 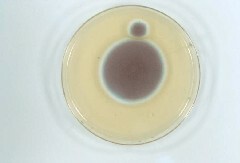 The spores are produced in chains and attachment scars may be present on opposite sides of the spores. In air samples they may be present individually or even in short chains. In culture the distinctive branched conidiophore is the key to identification. The surface of these spores ranges from smooth, to slightly rough, to distinctly spiny. 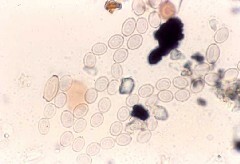 Spores of Penicillium are well known allergens.